DAVID BOWIE returns and how! At London’s V&A the crowds gather for the artist’s exhibition. The V&A magazine for the Spring contains some beautiful artwork on Bowie by Barbara Nessim. 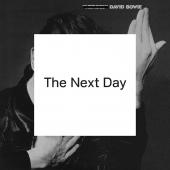 And not least, of course, the new album The Next Day. that immediately on release topped Britain’s Official Record Chart as published in the trade paper Music Week and broadcast on the BBC. Of course for months there has been a media build-up in Britain to Bowie’s return and the album has been given oceans of coverage in the existing music monthlies such as Mojo and Uncut. So to have local papers joined the act, as for instance the Cornishman in the far West of Britain. Crisis applauds the album. It has Bowie sounding as though he were 30 and not 66. The production from Tony Visconti is superb. Thus far, hats off! Less excellent is some of Bowie’s vocal projection It is a puzzle why this element pervades. It seems for such a talented artist odd that at time we have to think ‘what is he saying?” - - and this not the thought, but the ability to hear properly. One thing the maestro deals with is his own declining life longevity, that one areas that unties the simplest of humans to the most intelligent! Still, as he says, “I’m not quite dying.” He can say that loud and clear. BRUCE COCKBURN also returns without the Bowie fanfare. This Canadian artist has never achieved the notice that he richly deserves. He ranks high for his ability to weave Christian refection into his songs. Over the years he’s been one of Greenbelt’s favoured sons. For those into Cockburn – and really every one should – there’s an excellent interview with him in the R2 magazine for March/April. Cockburn’s new album is entitled Small Source of Comfort. Billy Bragg – Tooth and Nail.